This topic describes how to handle device orientation changes in Xamarin.Android. It covers how to work with the Android resource system to automatically load resources for a particular device orientation as well as how to programmatically handle orientation changes. Because mobile devices are easily rotated, built-in rotation is a standard feature in mobile OSes. Android provides a sophisticated framework for dealing with rotation within applications, whether the user interface is created declaratively in XML or programmatically in code. When automatically handling declarative layout changes on a rotated device, an application can benefit from the tight integration with the Android resource system. For programmatic layout, changes must be handled manually. This allows finer control at runtime, but at the expense of more work for the developer. An application can also choose to opt out of the Activity restart and take manual control of orientation changes. Declarative Layout Rotation – How to use the Android resource system to build orientation-aware applications, including how to load both layouts and drawables for particular orientations. Programmatic Layout Rotation – How to add controls programmatically as well as how to handle orientation changes manually. 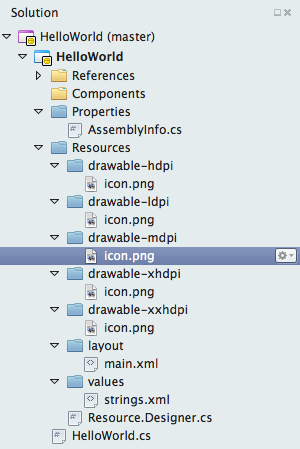 Layout Resources – Specifying which layout files are inflated for each orientation. Drawable Resources – Specifying which drawables are loaded for each orientation. In addition to the layout folder (which defaults to portrait and can also be explicitly named layout-port by including a folder named layout-land), an application can define the views it needs when in landscape without any code changes. 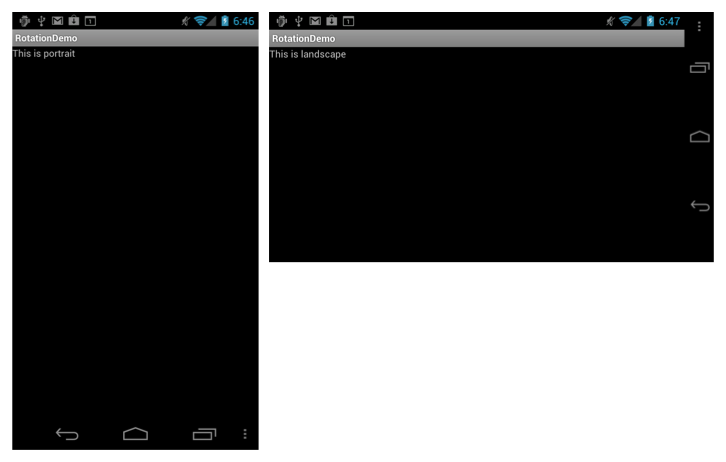 During rotation, Android treats drawable resources similarly to layout resources. In this case, the system gets the drawables from the Resources/drawable and Resources/drawable-land folders, respectively. Sometimes we define layouts in code. This can happen for a variety of reasons, including technical limitations, developer preference, etc. When we add controls programmatically, an application must manually account for device orientation, which is handled automatically when we use XML resources. Add controls to the layout. Set the layout as the content view. For example, consider a user interface consisting of a single TextView control added to a RelativeLayout, as shown in the following code. 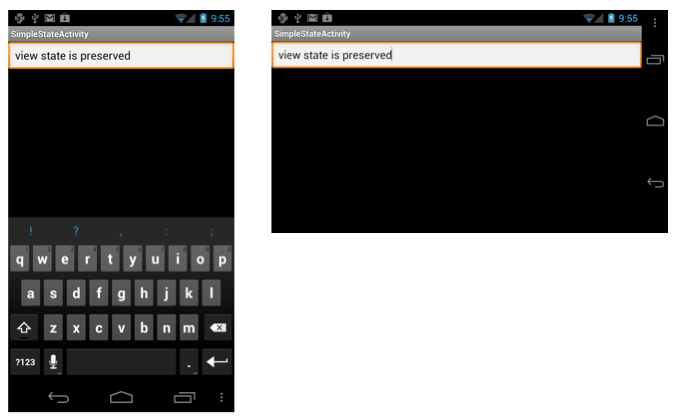 Here the TextView's layout parameters are initialized for both landscape and portrait. Class variables hold the parameters, along with the TextView itself, since the Activity will not be re-created when orientation changes. The code still uses the surfaceOrientartion in OnCreate to set the initial layout for the TextView. After that, OnConfigurationChanged handles all subsequent layout changes. When we run the application, Android loads the user interface changes as device rotation occurs, and does not restart the Activity. Activity restarts caused by device rotation can also be prevented if we define the layout in XML. For example, we can use this approach if we want to prevent an Activity restart (for performance reasons, perhaps) and we don't need to load new resources for different orientations. To do this, we follow the same procedure that we use with a programmatic layout. Simply set ConfigurationChanges in the ActivityAttribute, as we did in the CodeLayoutActivity earlier. Any code that does need to run for the orientation change can again be implemented in the OnConfigurationChanged method. Whether handling rotation declaratively or programmatically, all Android applications should implement the same techniques for managing state when device orientation changes. Managing state is important because the system restarts a running Activity when an Android device is rotated. Android does this to make it easy to load alternate resources, such as layouts and drawables that are designed specifically for a particular orientation. When it restarts, the Activity loses any transient state it may have stored in local class variables. Therefore, if an Activity is state reliant, it must persist its state at the application level. An application needs to handle saving and restoring any application state that it wants to preserve across orientation changes. 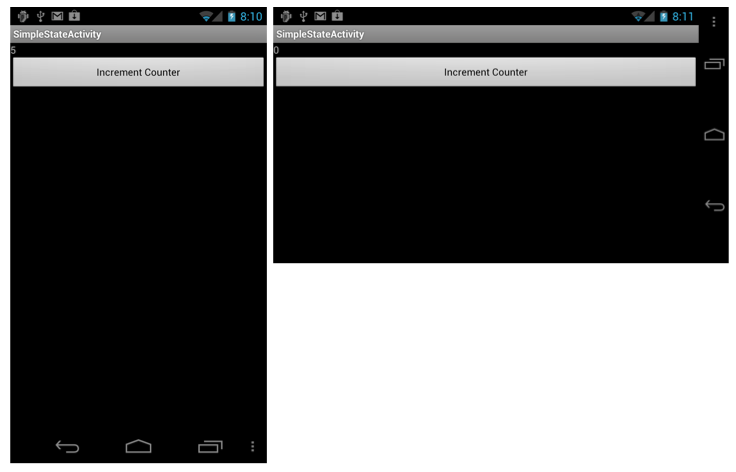 For more information on persisting state in Android, refer to the Activity Lifecycle guide. 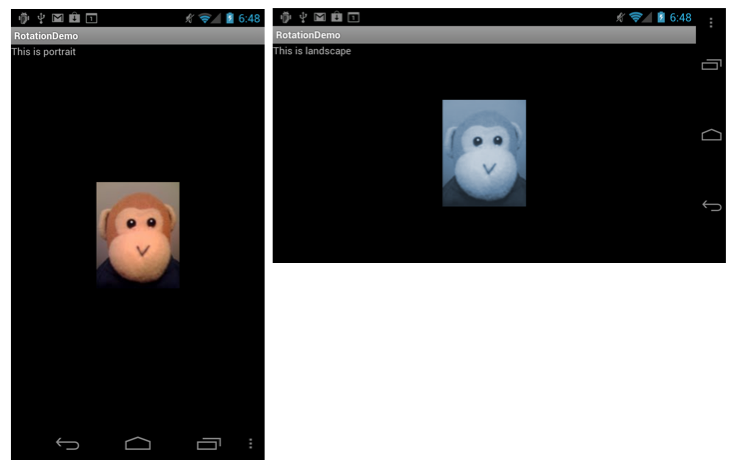 This article covered how to use Android's built-in capabilities to work with rotation. 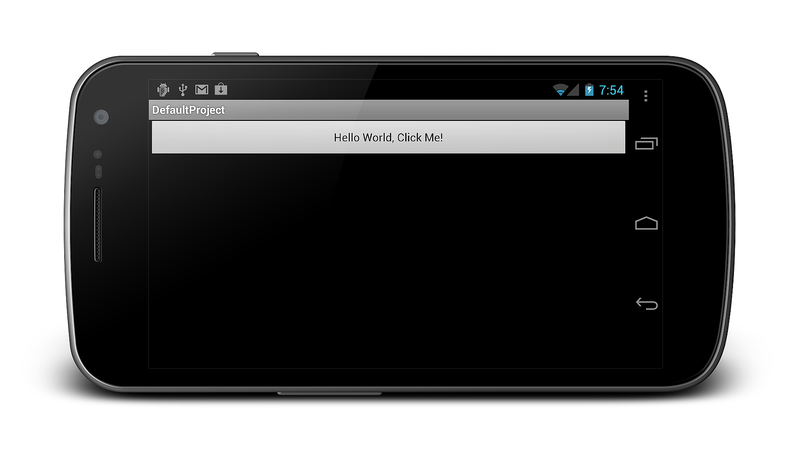 First, it explained how to use the Android resource system to create orientation aware applications. Then it presented how to add controls in code as well as how to handle orientation changes manually.